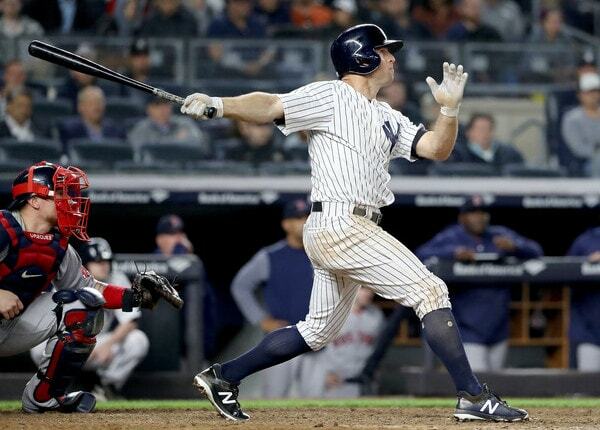 Last night, for really the first time this season, Brett Gardner was a catalyst atop the lineup for the Yankees. The team’s longtime leadoff man took a .198/.320/.248 (65 wRC+) batting line into the game, which is objectively awful, and prior to the game Aaron Boone was asked whether it’s time to consider a change in the leadoff spot. Boone dismissed the notion. Right on cue, Gardner broke out after receiving his manager’s support. Gardner went 3-for-5 with two doubles and a big go-ahead triple last night, nearly doubling his season extra-base hit total (four to seven) in the game. He would’ve had a another double as well had Mitch Moreland not made a great diving stop on a ball down the line. Ups and downs are normal part of baseball, though in Gardner’s case, we’re talking about a player three months away from his 35th birthday, so it’s natural to wonder whether his slow start is the product of age-related decline. It’s not just that Gardner is about to turn 35 too. The guy plays all out all the time and it takes a toll on the body. Plate discipline is a quote-unquote old player skill, meaning it tends to age well. So, even if Gardner is in decline, his ability to work an at-bat would not necessarily be compromised. The plate discipline is still there and that’s good, even if it doesn’t necessarily mean Gardner is not in decline. 2. He’s not swinging and missing. When it comes to pitches in the strike zone, Gardner has always been among the best at making contact. That continues to be true this year. His zone contact rate this year: 90.5%. It was 92.4% last year and 91.9% the year before that. The MLB average is 85.0%. Gardner is swinging and missing a rate right in line with the rest of his career. Plate discipline and walk rate tends to age well but contact rate does not. Older players have a tendency to swing and miss more often because their bats are slow and they have to cheat. In the early going, Gardner’s contact rates are very good, as usual. 3. He’s making a typical amount of hard contact. No one is going to confuse Gardner for Aaron Judge or Giancarlo Stanton, but his hard contact numbers this year are actually a tick better than usual. He has a 31.3% hard contact rate. It was 28.8% last year and 25.8% the year before. His career rate is 24.1%. 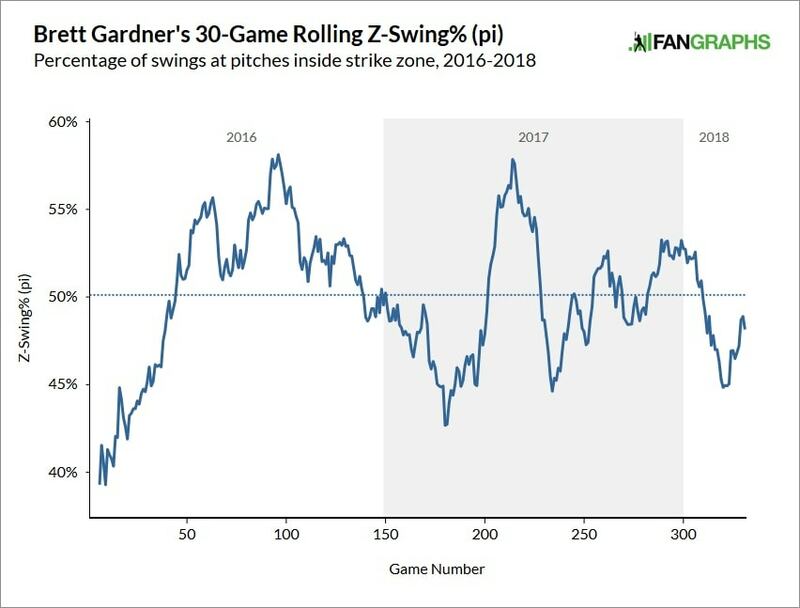 Gardner’s career average swing rate on the pitches in the zone is 52.4%, which is well below the 63.6% league average. Earlier this year his zone swing rate was sitting in the 40% to 45% range before that recent uptick you see in the graph. I think Gardner was caught in between a bit. Thinking too much at the plate and being unable to pull the trigger on hittable pitches, you know? One game doesn’t mean Gardner is out of the woods — he’s still hitting .214/.329/.294 (76 wRC+), after all — but it was certainly encouraging. He didn’t go 3-for-5 with two bloops and an infield single last night. Gardner ripped two doubles against Rick Porcello, who’s been great this year, and nearly had a third double as well. He also tripled into the opposite field gap against Craig Kimbrel. A hitter who’s lost at the plate probably doesn’t do that. I am totally cool with platooning Gardner at this point of his career. He’s hit .225/.305/.302 (66 wRC+) against lefties since Opening Day 2016 and that ain’t gonna cut it from the leadoff spot. Sit him against southpaws, or at least move him down in the lineup, for sure. Bat Hicks leadoff against lefties. Maybe even Gleyber Torres. It shouldn’t be Gardner though. We have enough evidence showing he struggles against same-side pitchers. Aside from the platoon issues, I don’t see enough to make me worry Gardner is in irreversible decline. He’s working quality at-bats and he’s hitting the ball as hard as he usually does. As we saw last night, these things can turn around in an instant. He’s been slumping pretty much all year, sure, but I don’t think it’s time to remove Gardner from the leadoff spot against righties yet.